The HP Ethernet 10Gb 2-port 530 SFP+ is a dual port adapter featuring the next generation of 10Gb Ethernet integration offering a single chip solution further reducing power requirements for 2 ports of 10Gb Ethernet connectivity. 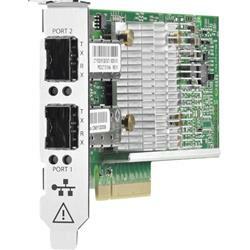 It is designed for use in HP ProLiant Gen8 Rack and Tower servers. Leveraging Broadcom's market-proven NetXtreme II architecture and software, the HP 530SFP+ adapter delivers full line-rate performance across all ports with low power consumption. The HP 530SFP+ dual-port design is ideal for high performance computing, server virtualization, security, server consolidation, and other applications requiring highest throughput. The total aggregate, full-duplex throughput of 40Gb/s meets the needs for customers desiring highest bandwidth.